If you are going to purchase the Decisions book, or anything else from Amazon, I would be grateful if you could use this link to do so, as I will then make a few cents affiliate commission, which helps me to meet my costs. 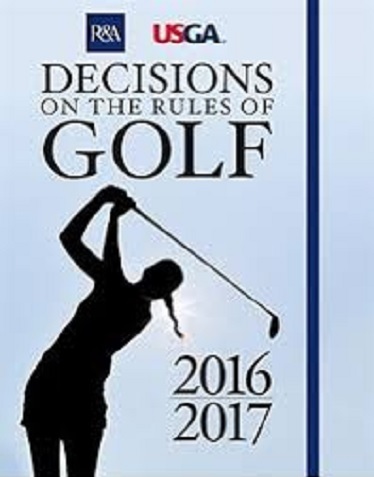 Strangely, the USGA hard copy publication does not seem to be available from either Amazon or the USGA, but Amazon do have a Kindle (eBook) version at $15.99, which can also be purchased at my link above. The only difference between the R&A and USGA versions is the spellings of some words, as the Rules and Decisions have been unified for many years. Generally, a statement such as this would not be considered ‘advice’, as is defined in the Rules of Golf. Such statements are usually made as a courtesy, when someone decides to putt out of turn in stroke play, rather than to council or influence the player in his play. However, the ruling very much depends on the context of the conversation and circumstances. If it is simply a courtesy to tell the player they don’t have to rush on your behalf, then fine. But if it is stated in a way to counsel the player to slow them down, then this may result in a different ruling. When is a Ball Replaced on a Putting Green Back in Play? Q. A player replaces his ball on the putting green but does not remove his ball-marker. Subsequently the wind moves his ball to a new position. What is the ruling? A. Under Rule 20-4, a ball is in play when it is replaced, whether or not the object used to mark its position has been removed. Consequently the ball must be played from the new position. There is no restriction in Rule 16 as to how many times a player may mark and lift their ball on the putting green, providing they do not unduly delay play. It is not uncommon to see a player replace their ball at the ball-marker, step back to check the alignment of their intended line of putt, move the ball again, and repeat this process until they are satisfied that the ball is correctly aligned, before removing their ball-marker. In this scenario, the ball is in play whenever the player has released it at rest, and is out of play whenever they touch it. The same applies no matter how many times they touch, move or lift the ball. However, if any part of their equipment causes their replaced ball to move, they are penalised one stroke under Rule 18-2a, even if the ball-marker is still in place. I have edited my blog from two weeks ago, which summarised the main amendments to the Rules of Golf, effective 1st January 2016, into a single A4 page that can be printed out for posting on Club and Society notice boards, or included in a newsletter to members. Click on this link, then click on the box labelled, ‘DOWNLOAD PDF’ and print out from there. Please leave my accreditation on this single page document. This is the link to purchase the Decisons on the Rules of Golf 2016-2017. This is the link to print out the notice board document of the main amendments to the Rules of Golf, effective 2016.
what rule was used to give Branden Grace a free drop off the top of a bunker in the recent HSBC tournament. You state "a player may mark and lift their ball on the putting green, providing they do not unduly delay play" then in the very next sentence comment how they may repeatedly realign the ball for a putt. How does that not constitute undue delay? It's on the green, putt it! The constant tiny adjustments players are making with the stupid line on their ball has slowed the already slow pace of play. It needs to end. The clue is in the word "unduly"! I do not write the Rules, but I do try and interpret them for the benefit of others. The solution to rakes in bunkers is to have PVC embedded in the ground a couple of feet from the bunker with the rakes placed in them like a flag stick. Reduces profile to the player potentially hitting it and significantly reduces delay.